What the Market Has Not Discounted - Epoch Investment Partners, Inc.
Today’s market levels seem reasonable from several different perspectives. Monetary policy is approaching a neutral stance at the 5% level, and the market P/E on a trailing basis is approximately 16, a very reasonable measure. Then what, the wise investor might ask, could potentially tarnish this optimistic scenario? One potential answer could be the growing imbalance of the trade deficit. As far as trade is concerned, we get the goods and services provided by other countries, and our overseas trading partners receive our paper money in return. While they have to earn a dollar, we only have to print one! Because of this unsustainable relationship, the dollar will eventually fall. Still, if it falls 20% over three years, how bad can that be? And with a dollar decline, the trade deficit would certainly begin to improve. Another concern could be the fiscal deficit. But it is hard to imagine the fiscal deficit getting worse. In fact, based on second quarter government figures, it has already started to improve somewhat. So, if the ballooning trade deficit and the weakening dollar won’t necessarily result in a market slowdown, what will? We believe the real threat to current market levels is the possibility of a meaningful decline in the rate of growth of corporate earnings over the next several quarters. I am not sure when the trend will start but, to this money manager, it seems like an inevitability. 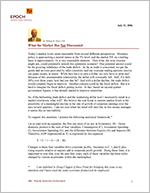 Changes in these four variables drive corporate profits. Increases in C, I, and G plus rising exports relative to imports add to corporate profit growth. Along these lines, it is important to note that, over the past four years, each of these variables has been turbo-charged by various accelerants within the marketplace. Consumption has grown faster than disposable personal income growth and this difference has meaningfully added to corporate profit growth. Investment spending has increased substantially due, in large part, to the above-trend growth rate in residential investment spending. The fiscal deficit has soared because government spending has vastly exceeded tax receipts, and this scenario has had a very positive effect on corporate profits. The one drag on profits has been the increasing trade deficit as imports have grown at a faster pace than exports. Through the model presented above, we can create an even more nuanced and flexible representation of the drivers of corporate profits. Bear with me here, as the algebra becomes longer, but it still is the Econ 101 concept of C + I + G + (X – M) = GDP. ** See Martin Feldstein Article from Foreign Affairs May/June 2006. As you can see, the results are remarkably accurate. Now that we have verified the usefulness of this formula, let’s look ahead to the trends that will emerge in tomorrow’s investment landscape. First of all, the consumer cannot continue to dis-save. In other words, the C-DPI gap must decline. If consumption falls below disposable personal income growth, C-DPI will turn negative, which means that savings will grow, and will therefore be a drag on corporate profit growth. Similarly, Residential Investment spending has to decline from present levels simply because this component of total investment in relation to GDP is currently far above any U.S. historical average level. As for G-T, the budget deficit could get worse, but we doubt it. Even the current administration, which has been defined by its ongoing fiscal recklessness, must face the fact that our government paper is now held by non-US entities to a level that exceeds 50% of the outstanding treasury debt. If the coming year does not bring about another annual increment to the deficit, which seems likely, corporate profits would be negatively impacted. The trade deficit resulting from M exceeding X in the quantity (X-M) should lessen in 2007 as the softening dollar begins to help exports and stabilize imports. This would be a positive for profits. Moreover, if oil declines in price, the shift in (X-M) could be a real profit accelerant. Nevertheless, it seems no matter what scenario one might anticipate, corporate profits must slow, possibly to a very significant degree (Cliggot’s work indicates an actual decline in profits in 2007). Our guess is that profits will rise in 2007, but only into the single digits, with the swing factor being changes in the trade deficit. The stock market, in our view, has not adjusted to this coming tipping point in corporate profits, and therefore remains vulnerable. So, what is the informed investor to do? In order to sidestep the effects of slowing corporate profits, we recommend investing in those companies that will benefit from the changing trade deficit, and avoiding manufacturers of domestic-only goods and firms dependent on discretionary consumer spending. Aerospace, integrated oils, some chemicals, gold and consumer non-discretionary should be favored. Real estate, financial entities and retail should be avoided. In addition, we believe that dividend yield plays will work across the board. And, in many ways, the same fundamentals will continue to apply: the most investment-worthy firm will be a company with transparent financial statements, rising free cash flow available at a below-market multiple, and a management team that knows how to intelligently deploy free cash flow to the benefit of shareholders through either dividends or accretive internal projects and acquisitions. In conclusion, we believe that the profits generated by corporations will decline in the next several quarters relative to GDP. But, by following the strategy outlined above- a focus on the positive effects of globalization, the financial metrics of running a business and, in particular, the intelligent use of free cash flow- investors can build a winning portfolio. *I am indebted to Doug Cliggot of Race Point for bringing this issue to my attention and I have used the same economic framework he employed.